Since the snowy night when her family's car slammed into a tree, killing her parents and little sister, Sasha has been unable to speak except through a computer with a robotic voice. Nothing is wrong with her body; that's healed. But, after four years, Sasha's memory, and her spirit, are still broken. Then one day, she's silently cussing out the heavy book she dropped at the library when a gorgeous, dark-haired boy, the kind of boy who considers Sasha a freak or at least invisible, "answers" Sasha's hidden thoughts -- out loud. Yes, Ben can read minds; it's no big deal. He's part of a family with a host of unusual, almost-but-not-quite-supernatural talents. Through Ben's love, Sasha makes greater progress than she has with a host of therapists and a prominent psychiatrist. 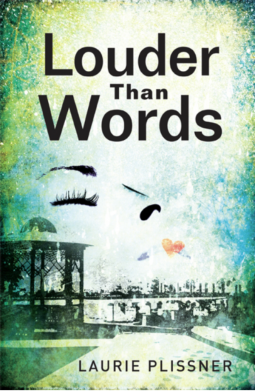 With him to defend her, bullies keep the world from ever understanding Sasha, he pulls away. Determined to win him and prove her courage by facing her past, Sasha confronts her past -- only to learn that her family's death was no accident and that a similar fate may wait for her, in the unlikeliest of disguises. I honestly can't imagine not being able to speak for myself, literally speak. Sasha, it seems to me, is doing remarkably well for such a horrible tragedy. Sure, she has only one friend, but she attends school, has a support system, and isn't in an institution or considered suicidal. Really, I think she's doing pretty well. Aside from that pesky mutism thing. I liked the story okay, but it felt like it was just trying to be too many things, have too many elements. There's the mystery surrounding the car accident that killed her family, there's the mind-reading boyfriend, then the "push past the tragedy/heal myself." Two of those would've been great, all 3 was over the top. And Ben is too together, too mature/worldly, too unbelievable to make a good connection with the reader. I like Alyssa's stubborness and I like that she overcomes her problems and finally achieves closure. It certainly shows that you can overcome crippling tragedy. Disclosure of Material Connection: I received this ebook galley from Merit Press through the netGalley publisher/reader connection program. I was not required to write a positive review. The opinions I have expressed are my own. But, gosh, I like 'em weird. Okay, so there's the "real world" where Glenn lives. It's "normal," though definitely dystopian from what we would consider normal. Then there's "The Rift," very near her home, and forbidden. Something happened, years ago, causing a literal rift. And her world isn't allowed to be near the rift. The people on the other side of the Rift never turned loose of magic or imagination. It's a darker side of our usual "fantastical" world idea, but it's more alive somehow than the world Glenn has grown up in. Glenn and Kevin (her friend turned love interest) are amazing characters. So deep, interesting, vibrant--Hirsch has done a fabulous job of creating them. I'd almost think they were completely real people he just happened to write about. Their relationship-story is perfect: not instantaneous, but full of struggle then a natural shift from platonic to romantic. 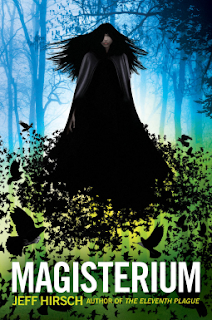 The world of Magisterium (on the other side of the Rift) is one of the most real fantasy worlds I can think of. It's not Narnia (which I adore for it's very innocent nature, despite the evil that comes into it). Instead, Magisterium has politics, and danger (REAL danger! ), and characters that you don't want to like not because they're a wicked queen, but because they are purely evil and bad. I think Hirsch has hit the nail on the head with this one. Interesting infographic concerning the relationship between e-books and print books. Since ebooks have become so popular (when fiction started being digitized and e-readers became easily attainable), there's long been discussion among the people in the business of reading (teachers, librarians, publishers, etc.) about the future of the 2, and will one eliminate the other. TeachingDegree.org has the infographic below to illustrate that there is no Darwin-like "survival of the fittest" battle going on here. Coexistence IS possible! 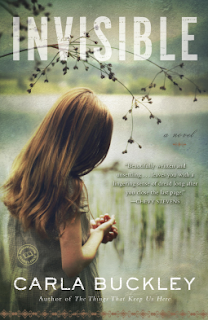 Growing up, Dana Carlson and her older sister, Julie, are inseparable-Dana the impulsive one, Julie calmer and more nurturing. But then a devastating secret compels Dana to flee from home, not to see or speak to her sister for sixteen years. Julie has left behind a shattered teenage daughter, Peyton, and a mystery-what killed Julie may be killing others, too. Why is no one talking about it? Dana struggles to uncover the truth, but no one wants to hear it, including Peyton, who can't forgive her aunt's years-long absence. Dana had left to protect her own secrets, but Black Bear has a secret of its own-one that could tear apart Dana's life, her family, and the whole town. 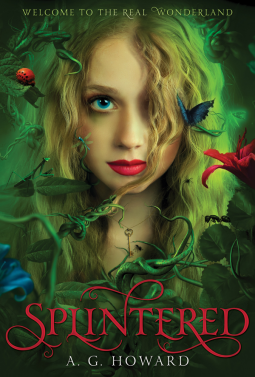 This is NOT a young adult book--hence, the "Adult for YA" label. Two voices tell this story. Dana, a long-estranged sister who returns home just in time to discover that her sister has died, and she didn't even know she was ill. And Peyton, a teenager trying desperately to determine who she is while grieving the loss of her mother. Dana's is the strong, independent voice of a woman with regrets and determined to fix what she can of them. Peyton's "story" is told through her love of marine biology. She relates every life lesson to marine animals and how the environment for them works. It's just how she thinks. Each starts on a quest for answers to just what happened to Peyton's mom/Dana's sister, and what is happening to people all through town. While each is on her own journey for an answer, they soon discover that the road is the same. Okay..so that's the "Jodi Picoult-like" part about the book. Just a good, heart-wrenching read. But there's also a little science fiction/mystery to the story. Nanotechnology is still relatively new to the general public, so to read about ways and places and THINGS it's used in was shocking and a little scary. As far as the story goes, it's excellently done. You get attached to the characters and need to feel closure for them more than for yourself as a reader. Everything about it is believable, though it was hard to believe that this could really happen--in the "I don't want to believe it could" kind of way. Disclosure of Material Connection: I received this ebook galley from Random House Publishing Group through the netGalley publisher/reader connection program. I was not required to write a positive review. The opinions I have expressed are my own. I found this site the other day when one of my Facebook friends shared a link to the NGA's Children's Tour called "Time Travel" It's an online version of an audio tour you can take when you visit the NGA in person. But, realistically, how many of our students will have that opportunity while in school? It's really fascinating to look at the images in the "Time Travel" tour and learn specifically about the painting. 18-year-old Jonathan Harker is diagnosed with a rare blood disorder after visiting a Romanian Count. His girlfriend Mina and a pre-med student named Van Helsing team up to investigate the source of the disease. The teenagers discover a horrifying truth: the Count is a vampire. 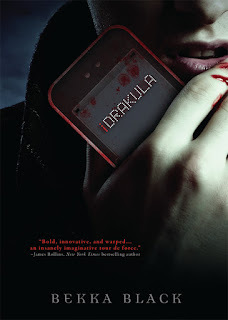 The harrowing events unfold through emails, text messages, web pages, Twitter feeds, and instant messaging—the natural modernization of Bram Stoker’s original Dracula, which was written in letters, diary entries, and news clippings. Much like when I read iFrankenstein a few weeks ago, I wasn't prepared to like a modernized version of Bram Stoker's classic. I'm particular, meaning, I'd rather you didn't futz with classics. But, I forgive Bekka Black, she does a great job. This isn't intended to be Stoker's Dracula. It's not a perfect retelling/remastering. This is its own story. Simply the style Black opted for--the "literature" of teens today, if you will--doesn't lend itself to the classic. There's no drawn out colorful prose. It's all quick, meant for easy digestion, not deep contemplation. The characters are about as deep as a text message. You have to spend more time dissecting the words themselves, not the characters intentions or hidden meanings. What is written is what is meant. I think this is a masterful application of modern communication, to share a personalized version of Dracula. 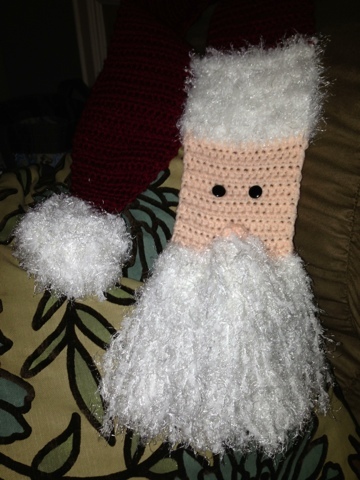 Bekka Black has done an awesome job. I'm ready for her to tackle Dr.Jekyll and Mr. Hyde, my personal favorite horror story. Disclosure of Material Connection: This ebook is from my personal collection. I was not required to write a positive review. The opinions I have expressed are my own. 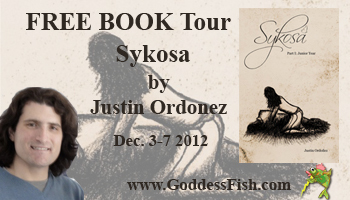 Author Justin Ordonez is GIVING away copies of his book Sykosa to 3--THREE--lucky commentors during this week's blog tour. Comment here, and comment on the other stops to catch as many chances to win as possible. Tour dates and stops can be found here. Sykosa (that's "sy"-as-in-"my" ko-sa) is a sixteen-year-old girl trying to reclaim her identity after an act of violence shatters her life and the life of her friends. This process is complicated by her best friend, Niko, a hyper-ambitious, type-A personality who has started to war with other girls for social supremacy of their school, a prestigious preparatory academy in the Pacific Northwest of the United States. To compensate, Sykosa has decided to fall in love with her new boyfriend, Tom, who was involved in the act of violence. Propelled by survivor guilt, an anxiety disorder, and her hunger for Tom and his charms, Sykosa attends a weekend-long, unchaperoned party at Niko's posh vacation cottage, where she will finally confront Niko on their friendship, her indecision about her friends and their involvement in the act of violence, and she will make the biggest decision of her life—whether or not she wants to lose her virginity to Tom. YA fiction for the 18+ crowd. the concept that she wants to go to Prom, thus he should ask her to Prom and then they should go to Prom is simple, right? It’s not. You see, he has this best friend, this confidante, this main focus, this everything—and her name is not Sykosa, but Mackenzie. So, every day, she faces the fact that they are merely acquaintances. Two pigeons in a flock of nine hundred who dress the same, talk the same, and act the same. That’s okay. Pigeons are only pigeons because conformity is only conformity. It’s okay to be like everyone else so long as she is always herself. And that is the reason, because there is no other reason, why she makes out with this boy. Other than she likes it. Kissing is fun. She’s lying. There is another reason. Another trivial teenage doodad—when she talks to him, lame as it sounds, she feels like she is being herself. Sykosa is also available FREE for your Kindle at Amazon this week. WOOHOO!